Oliver turned three a few weeks ago, and we had a birthday party for him at the local children’s museum with his closest friends. That morning we ate satsumas for breakfast as he helped me make the chocolate frosting for his cupcakes and put the sprinkles on each one. I told myself not to worry about the mess; three year olds aren’t known for neatness in the kitchen (or anywhere). As with most kid birthday parties, it was exhausting and I barely had time to chat with any of the parents or even take many photos. You get home too overwhelmed to think about dinner and wonder why you went to the trouble in the first place. But then, of course, Oliver had a great time and was talking about it for days, and that’s really all that matters. We settled into the birthday weekend with a special lunch and O’s first haircut, and I baked up some of these Pecan Pie thumbprint cookies to test out for the holidays. 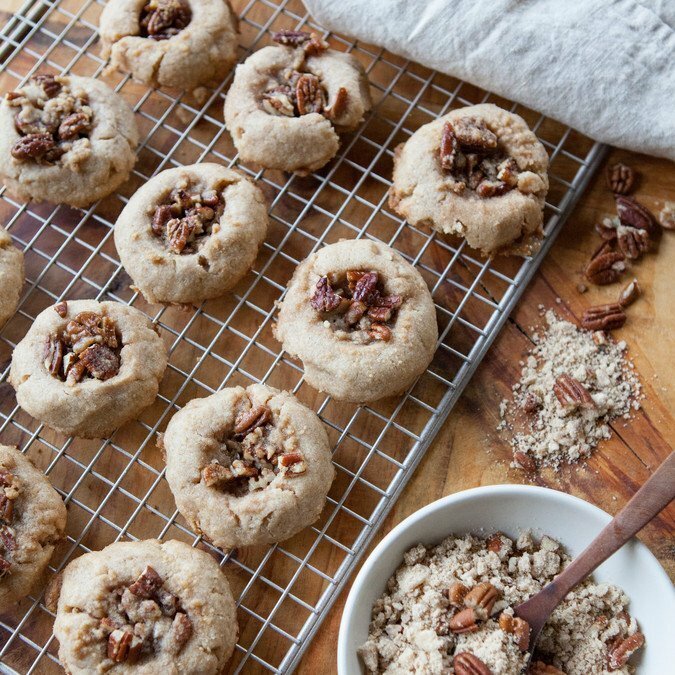 They’re basically pecan pie in cookie form; what’s not to love? In planning Oliver’s birthday, I made the mistake of not writing “no gifts, please” on the invitation, so he did get quite a few generous gifts from his friends and tore through them when we got home. Kind of mindlessly but joyfully, as three year olds are known to do. Grandparents also sent gifts, of course, as did Aunts. I tend to be a minimalist at home and hate clutter, so kid toys are a challenge for me and while we’ve started to think of smart ways to store everything, we’ve also started to think about really intentional gifting during the holidays and what we want that to look like for our kids. At three years old, Oliver doesn’t have a concept really for what to expect from a holiday like Christmas. And I feel very conscious of the fact that now is the time to start setting a precedent. I read recently of a family who chooses a gift you “want, need, can wear and can read” and I LOVE this and want to adopt it. When our kids are a bit older, I’d love to plan a family trip instead of doing lots of gifts. So as we sit here in the first week of December, we’ve got the tree up and the lights strung (with the yearly quarrel, errrr conversation, about white lights vs. colored lights – Sam being a champion for the latter) and are working to think of traditions we’ll continue and new ones we’ll make versus what big present we’ll get Oliver (or each other) this year. The zoo has a holiday lights celebration and we’re going to ride the Santa train to Snoqualmie to visit Santa (I may be as excited about this as Oliver). We’ll bake lots of cookies and visit the reindeer at Swansons. I’m hosting a ladies cookie exchange at the house with all the moms from our parents group, and hope to have at least one dinner party. All more memorable than the latest gadget or toy, for sure. Those of you with kids: do you set any limits or constraints around gift giving in your house? I’d love to hear your thoughts. Truly. In the meantime, let’s bake! A few tips for successful cookies: So these cookies are straight up delicious — or I wouldn’t share them with you. The actual cookie / thumbprint dough is perfect. You could fill these with your favorite jam if you’d rather. But if you’re going the pecan pie route, just take a few steps to make sure your filling doesn’t seep out of your cookie. 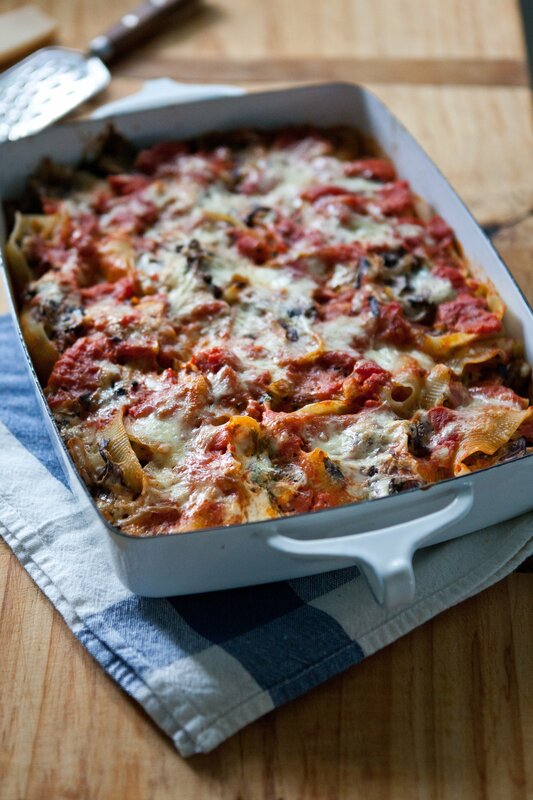 First, better to have a little too little filling than too much — don’t let it overflow when spooning it in. And thumbprint cookies always want to kind of crack a bit on the sides as you’re forming them — try to really minimize and smooth out the large cracks so the filling doesn’t seep out. Last, cookie scoops help speed things up here and make uniform cookies. I use a medium cookie scoop (about 1.5 tablespoons); it’s a great investment if you’re going to be doing much baking this season. Onward! 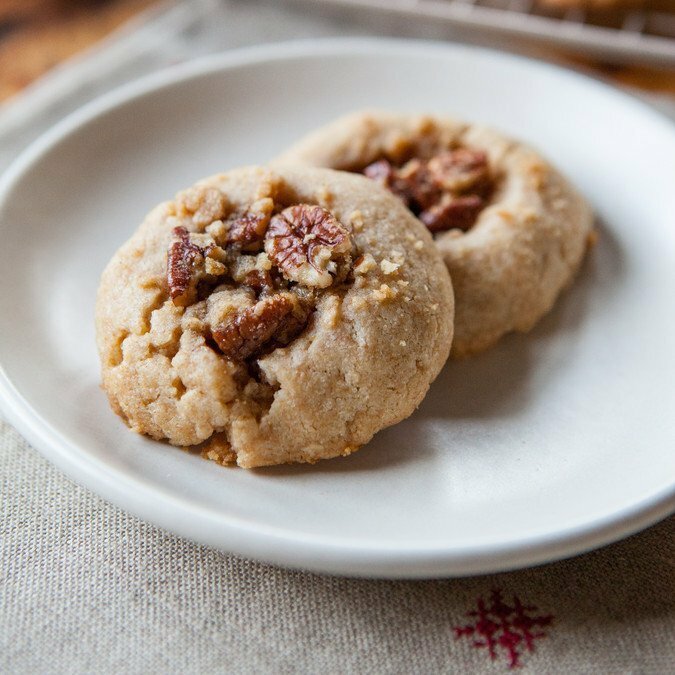 These cookies are a great one to pull off last minute as the dough doesn’t have to chill and there’s very little fuss. The number of cookies your recipe will yield will depend on the size of cookie scoop you use. If you use a smaller scoop than the one linked to above, you’ll yield more cookies (and, likewise, you could make larger thumbprints and only yield, say, ten cookies). It’s all good either way – just something to be mindful of if you’re baking for a crowd or aiming to get a very specific number of cookies. A sidenote: I typically find recipes that call for 1/8 teaspoon fussy, but you’ll see that noted in the crumble topping below. Feel free to just use a generous pinch of each spice instead of digging for your 1/8 teaspoon, and you’ll come out just fine. For the filling: In a small saucepan, combine butter, sugar, corn syrup and salt. Bring to a simmer over medium heat, stirring occasionally. 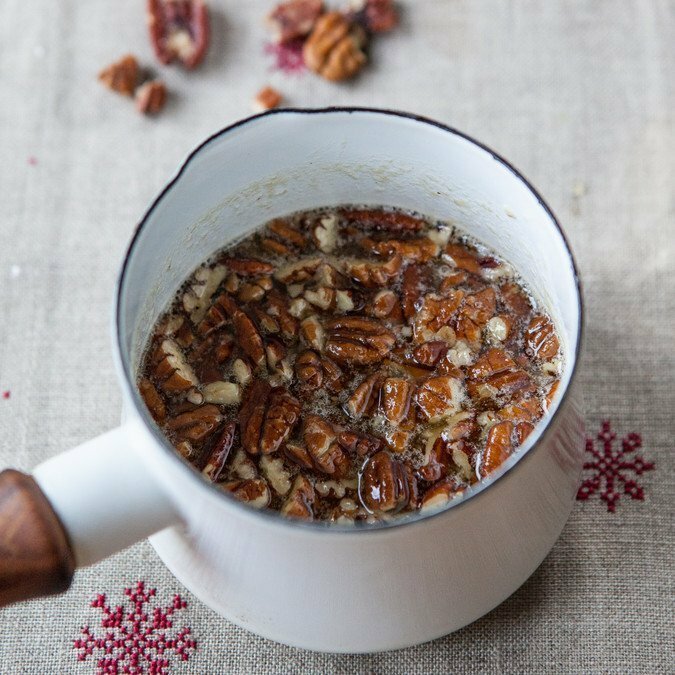 Stir in the pecans and remove from the heat. 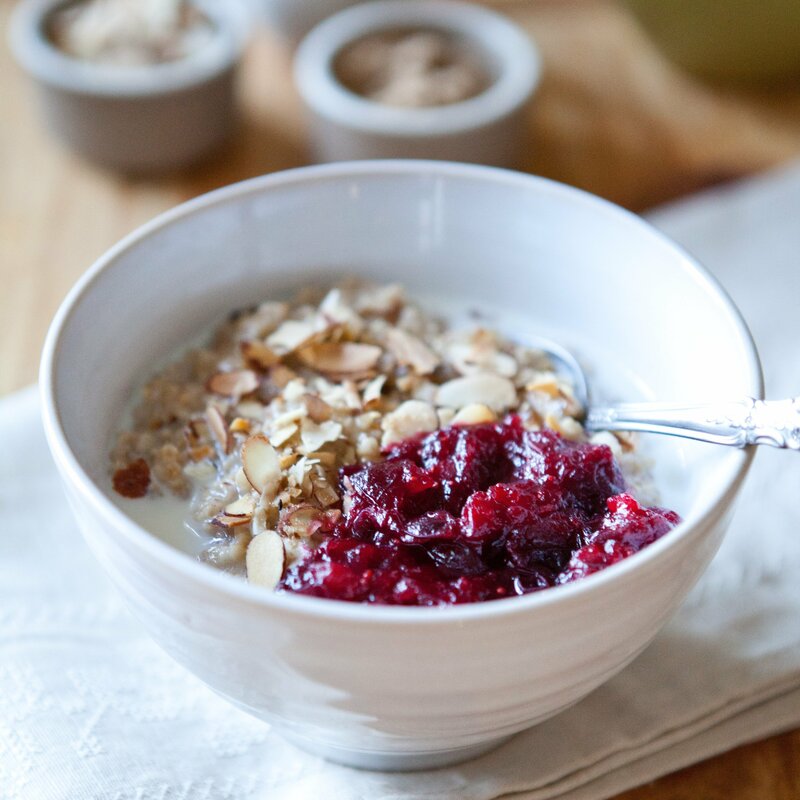 Set aside to cool while you prepare the crumble and filling. For the Crumble Topping: In a small bowl, whisk together flour, sugar, cinnamon, ginger, cardamom and salt. Add the butter and using your fingertips, work the mixture together until all of the ingredients are combined. Fold in the pecans (the mixture will be quite crumbly, but there shouldn’t be any floury bits). Refrigerate until ready to use. Preheat the oven to 375F. Line a large baking sheet with parchment paper or a silicone baking mat and set aside. 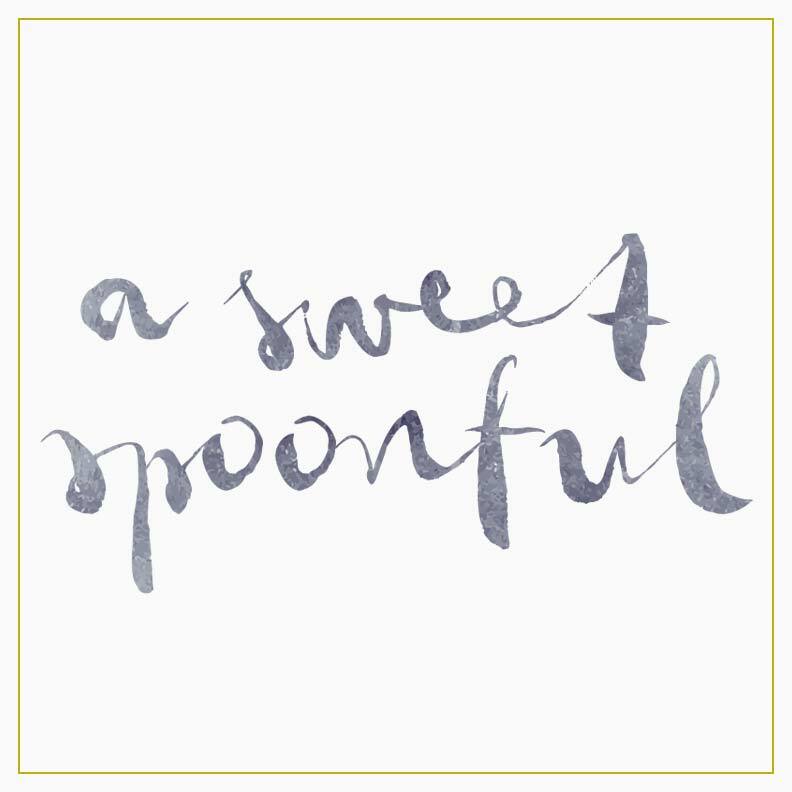 In a medium mixing bowl, whisk together both flours and salt and set aside. In a stand mixer fitted with the paddle attachment (or using electric hand beaters), cream together the butter and sugar until fluffy, about 3 minutes. Add the yolk and vanilla and mix until just combined. Reduce the mixer speed to low and slowly add the flour mixture, continuing to mix only until all the dry bits are combined. Scrape the bottom of the mixing bowl to make sure there aren’t floury bits on the bottom. Shape dough into even balls using a medium cookie scoop (or, if you don’t have one, use a heaping 1 tablespoon), placing them on prepared cookie sheet about 2-inches apart. Using your thumb, gently form an indentation in the middle of each cookie (start with a small indentation here. Be careful not to press all the way through to the pan and try to avoid deep cracks along the sides of the cookies as the filling can seep out). Bake for 5 minutes then remove from the oven. If the indentations are starting to disappear, reinforce and widen just a bit with your thumb, again taking care not to cause cracks along the sides where the filling could seep out. Spoon pecan filling just to the top of each cookie (don’t overflow! ), and scatter a generous spoonful of crumble topping over the tops of each. Bake for an additional 5-8 minutes, or until edges of cookies are golden brown. The filling will firm up as it cools. Cool on pan 5 minutes, then move to wire racks to cool completely. Cookies are best eaten within 3 days, and can be stored, covered, at room temperature. We are mindful that in some families Santa can only bring a small gift or two, so Santa brings a set of pajamas, a book, and silly stocking stuffers to our house. We don’t tend to buy bigger things at Christmas but when we do (our daughter’s rocking chair one year, a doll bed last year) those gifts are from us. I don’t want my child one day running her trap about her new bike from Santa, making a friend or classmate wonder why Santa doesn’t bring a bike to their house, too. Thank you for sharing, Abby. That's great, and I love the idea of the bigger gift being from parents instead of Santa. My mom always did pajamas every year from Santa, and we're continuing that tradition in our house now. Thank you again, and enjoy your holidays together! Hey Megan! I always love your posts, especially ones with tidbits about parenting :) I am also employing the “wear, read, want, need” theme this year! I haven’t been great about this stuff in the past so it’s always encouraging to hear about other people doing it too. I am all about the “experience” gifts too-one of the things I treasure is getting away with just our little family for weekend trips so I think that is what I’m going to ask for for myself :) Hope you continue to enjoy the cozy holiday season! Hi, Kaitlin! Thank you so much for taking the time to comment :) Yes, I love the experience gifts the most, too - things that maybe you wouldn't do on your own typically or things to do as a family. So great. I hope you have a wonderful rest of the holiday season as well. Enjoy! Hi, Laura! Ha, I smiled while reading this b/c I, too, get rid of things sometimes and only lately has Oliver started to really notice and look all over for a random ugly truck he never usually touched previously. I feel like my days are really numbered in that regard, too :) Enjoy the season - and great tip on choosing things to donate to needy kids. I love that. On my third birthday I received a present I was excited about and very soon after a family in the community lost their home and all possessions to a fire. My mom had me give my new toy to their daughter who was my age. I was *not* happy about it at the time but I think it left a lasting impression that objects are not things to cling to, especially if someone else might need them more. Perhaps there is a way to deal with a surplus of gifts in a similar way! Thank you, Rachel. So amazing that you actually remember this - it must've made a big impression for sure. Thank you for sharing - a really great reminder. I like to give my kids books, movies, a sweater or sweatshirt, gloves or mittens (not the snow ones, but the lightweight ones that *always* get lost or get a hole), and now that my kids are starting to get older, a game to play. My oldest asked for "craft supplies" too. The focus is definitely on things that can get used up or are easy to store! I keep the toy gifts to a minimum - our extended family will always send a few - but it's so nice to have some new games and other things to do during the next few months when we'll be spending so much time inside (we live in an area that can get plenty of snowstorms!). "Santa" fills the stockings with things like a toothbrush, wikisticks, play doh, an ornament for the tree, socks, bath drops, a deck of cards... We also take the time in October to sort through all the old clothes and get rid of toys that are broken or too babyish or otherwise unused. Do you read Bon Appetit? 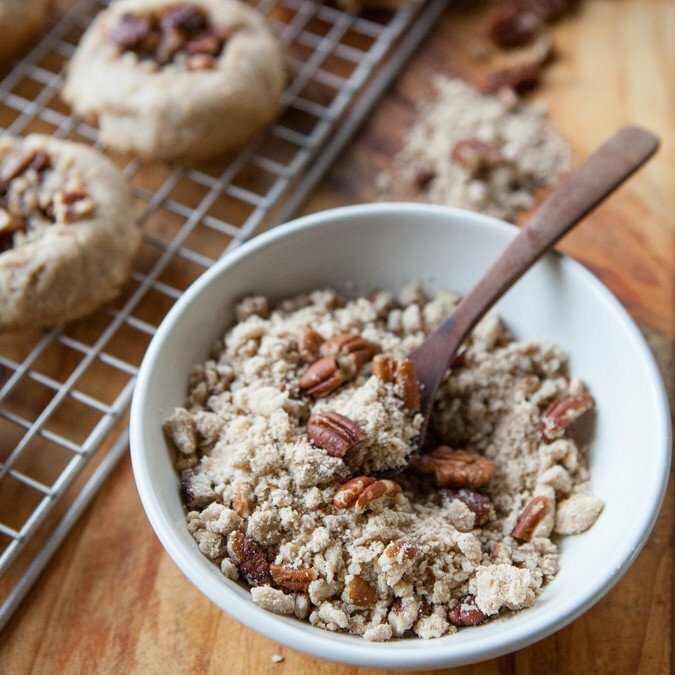 They had a pecan thumbprint cookie recipe this month--it is just delicious. 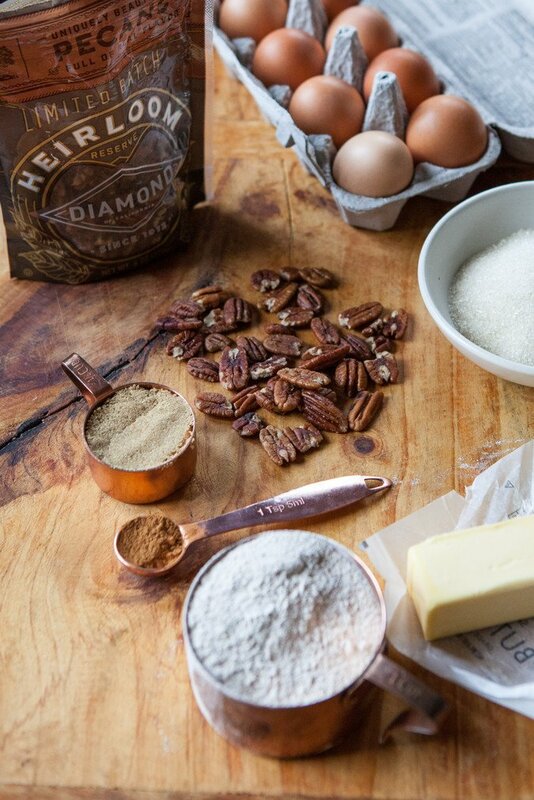 Pecans in the dough, and espresso powder in the filing. I will bookmark your recipe for next year! 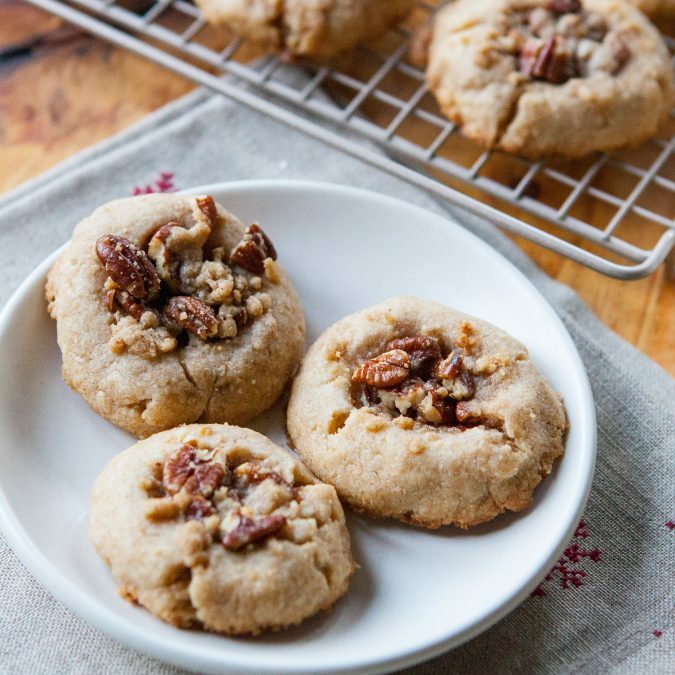 ... Or maybe just double up on pecan cookies this year?! Yum I did not see those! I'll take a look in my issue; thanks for the heads up! I put espresso powder in my pie filling at Thanksgiving (with chocolate!). Sounds great!